The three powerful BMG-780PRO grinding heads produces maximum coverage and effective distribution of grinding pressure on each individual head. This means each grinding head can be operated individually. 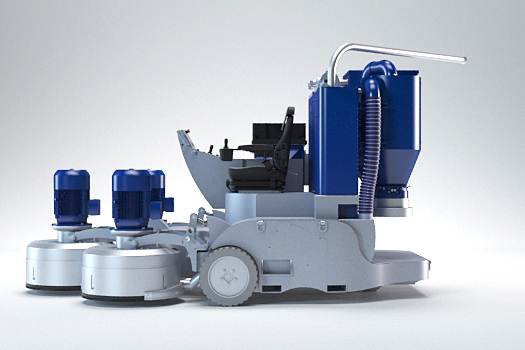 The machine comes as standard with variable grinding speed, rotation direction, and an independent suspension system. The BMG-2200 also has variable grinding pressure which makes it perfectly suitable for every jobsite. It is designed with an integrated powerful dust collecting system with HEPA 14 filters, which makes the BMG-2200 virtually dust free according to OSHA regulations. This heavy duty dust collection system is equipped with an automatic pulse filter cleaning system, Longopac system and is provided as standard with a pre-separator. Easy to operate due to joysticks for driving forward and backwards with cruise control option, a joystick for steering with 360° turn button and push buttons for the most common functions. The touchscreen provides all the feedback signals like the amperage of the grinding head, drivespeed and grinding pressure. The integrated dust collector system is equipped with a HEPA 14 filter system to comply with the OSHA regulations. Due to the standard preseparator, up to 95% of the dust can be captured before it is gets to the filters, which increases the lifetime of the filters. The vacuum and flow arechangeable due to three different blower settings so the dust collector can be set for the right type of job. The BMG-2200 is equipped as standard with a maintenance/ emergency power supply in case there is no 125A power supply available. When connecting 3 phase power supply with at least 16A, all functions will work,except the grinding heads and dust collector system. This allows you to drivethe machine and lift or lower the heads.